Our galaxy is full of very high energy photons known as gamma-rays. They come from pulsars, and cosmic rays; they even reach us from supermassive black holes and energetic explosions in distant galaxies. 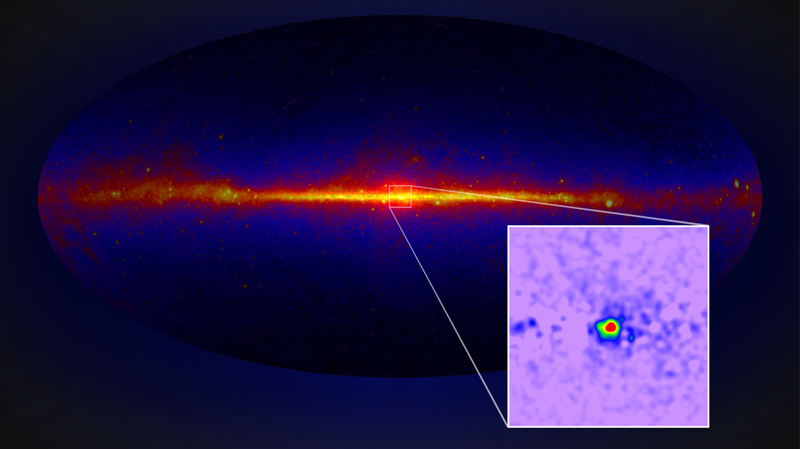 Some of the most intriguing gamma-rays, however, are not the ones that traveled billions of years to reach us, but the mysterious leftover gamma-rays, once all of these other sources are accounted for, coming from the center of our own galaxy. The origin of these gamma-rays has been hotly debated for years, but one of the most exciting possibilities is that they come from the annihilation of dark matter particles. If that is the case, then this would be a huge discovery – the first detection of dark matter! However, right now it is impossible to claim this discovery. The centers of galaxies are complex regions full of messy physics and it is very difficult to rule out less exotic origins. A recent update may help to clear up this mystery – a similar signal was detected coming from the center of our sister galaxy, Andromeda. Today’s paper studies this newly discovered signal and the signal from our own galaxy to determine whether they could be produced by the annihilation of dark matter. The authors take two approaches – first, they test whether the same type of dark matter particle could have produced the gamma-rays observed in the Milky Way and in Andromeda. Second, they see whether this same dark matter annihilation could also produce the radio signal coming from the inner regions of the Andromeda galaxy. 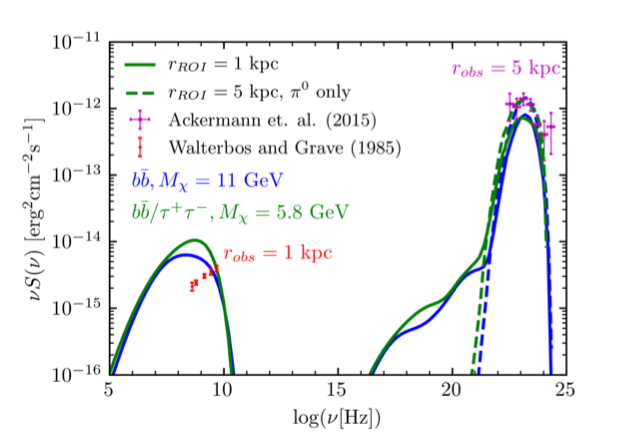 To test whether the same type of dark matter could produce both gamma-ray signals, the authors use the fact that the gamma-rays produced via dark matter annihilation depend on properties of the dark matter particles themselves. For example, more massive dark matter particles would produce higher energy gamma-rays, and particles that have a higher probability of interaction would produce gamma-rays in greater numbers. If the gamma-rays are coming from dark matter rather than complicated astrophysical systems, the two signals should look pretty similar. 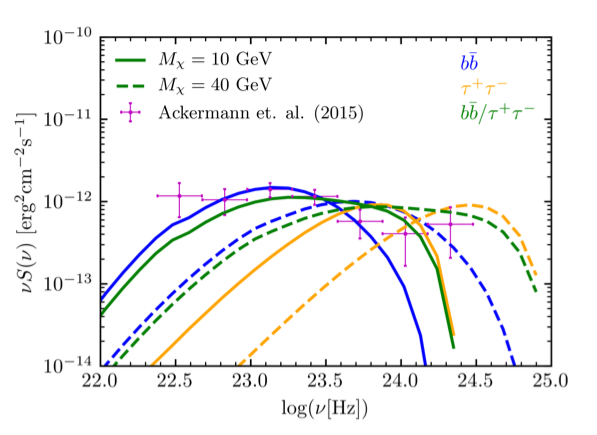 However, today’s paper finds that the gamma-rays from Andromeda are more likely to come from lower mass dark matter particles than the gamma-rays from our own Galactic center (Figure 3). The second approach taken in this paper is to compare the gamma-ray and radio observations of Andromeda. Dark matter annihilations produce a shower of particles, including gamma-rays as well as electrons and their anti-particle, positrons. When these charged particles travel through the magnetic fields of galaxies they emit radio synchrotron radiation. 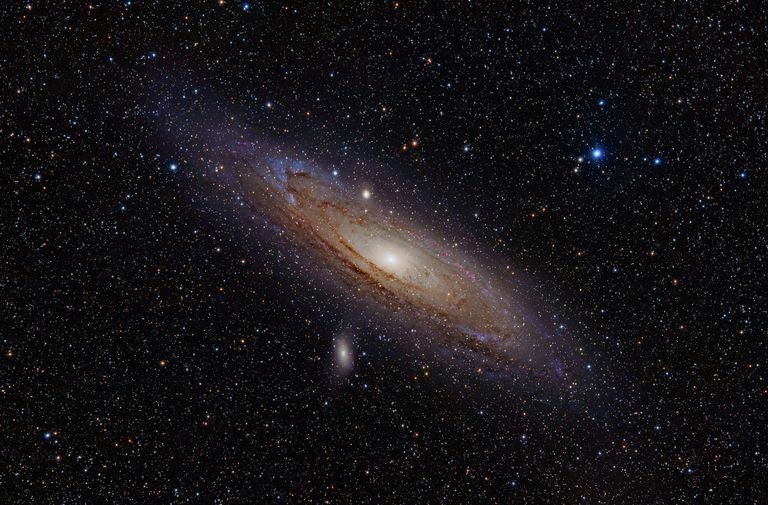 Therefore, if dark matter is annihilating at the center of the Andromeda galaxy, we should see both gamma-rays and radio synchrotron emission. This comparison is a bit more complicated, because the radio emission doesn’t only depend on the dark matter, but also on the magnetic field at the galactic center, and on how easily charged particles diffuse throughout the galaxy. Assuming typical values of the strength of the galactic magnetic field and the diffusion parameters, the authors find that the dark matter annihilation should be producing way more radio emission than we see coming from the central region of Andromeda (Figure 2). These conflicts do complicate things a bit for the dark matter annihilation hypothesis, but they do not completely rule it out. It is important to remember how complex the centers of galaxies are. We certainly do not have a complete understanding of the magnetic fields and the behavior of charged particles at the center of Andromeda. Additionally, it is very difficult to predict the density of dark matter at the galactic center, which determines how frequently dark matter particles would meet and annihilate. This study, however, is a great example of the power of combining different types of observations. Continued study of galactic centers at all wavelengths will provide better constraints on the origin of these mysterious gamma-ray signals.